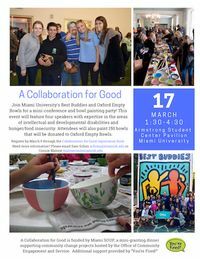 In the fall of 2018, Oxford Empty Bowls and Miami University's Best Buddies student organization presented the winning proposal at Miami SOUP (Service Oriented Unity Projects), a mini-granting dinner hosted by Miami University's Office of Community Engagement and Service. The first component of our winning proposal is to host "A Collaboration for Good" Mini-Conference and Bowl Painting Party. EVENT DETAILS: The 50-minute mini-conference will feature four speakers with interest and expertise in the area of intellectual and developmental disabilities (IDD), focusing especially on the Best Buddies experience, the IDD community and creative engagement in the arts, and hunger/food insecurity, both generally and in the IDD community. DATE: Sunday, March 17, 2019 TIME: 1:30 - 4:30 p.m. Doors open at 1:30 p.m. Mini-conference begins at 2:00 with bowl painting starting at 3:00. COST: Free REGISTRATION: Please register by March 5 through the Collaboration for Good registration form at https://goo.gl/forms/FxIolY91rdJ5BVtu1. Our event flier is attached — please feel free to share and help us spread the word! Further details, including information on parking, will be sent to registrants prior to the event.